Jason Didner and his wife Amy are the founders of the children’s music band The Jungle Gym Jam. They write the lyrics together and Amy plays percussion at Jason’s acoustic performances. The group has been awarded the Parents’ Choice Approved seal for their debut album Everyone’s Invited! On Tuesday, Jason and Amy will undergo a kidney transplant to relieve a continuously deteriorating diabetic complication Amy’s been experiencing over the past three decades. Jason and Amy have begun writing a series of articles about the transplant and family life on the band’s web site. Jason was kind enough to share his amazing journey and how they have helped their young daughter understand. Our daughter Holly never ceases to amaze us with the way she takes on new knowledge and makes it her own. So, two nights after we explained to our 4-year-old about the transplant operation that lies ahead, Holly came up to my side at the dinner table and said “I’m going to take this out of Daddy” and motioned as if removing an organ from my side, “and put it into Mommy.” She then proceeded to put this imaginary organ into Amy’s side. Holly has also demonstrated an understanding that the item that will placed in my wife Amy’s body – my kidney – will make her feel better and give her far more and better energy than she has now. Holly is very aware of Amy’s precarious medical condition that causes her to need several naps a day as her kidney function declines to urgent levels as a result of over four decades of strain caused by diabetes. Holly shares the hope with Amy and me that Amy will respond to her new life with a good, functioning kidney by playing vigorously with our daughter with energy to spare. A rigorous schedule of visits to the Transplant Center and to related departments at Hackensack University Medical Center has meant that some of those visits would require us to bring Holly with us – those visits that couldn’t be scheduled during normal school hours. On those occasions, the staff at the Transplant Center absolutely fell in love with our little girl, admiring her sweet, loving disposition. During recovery, Amy and I have strict requirements not to lift anything more than 10 lb. for about a month. Since Holly loves to be carried, I’ve found it important to start preparing her now, frequently quizzing her with questions like “What are Mommy and I not allowed to do after the operation?” Holly answers “Carry me.” Then I ask, “What else can’t we do?” She says, “Get jumped on.” Then I ask, “but what can we do?” And she answers, right again, “Hug and kiss,” but she doesn’t just say those words. She hugs me and kisses me while answering that last question. As Holly continued to explore her understanding of the transplant, she came to remember that I said my remaining kidney would grow bigger and stronger than it is now when I have both kidneys. She’s decided that she wants to have my bigger, stronger kidney. I said, “But I need one.” So she replied, “You can have one of mine.” I asked, “So you want to trade kidneys with me?” Holly answered, “Yes.” And I want one here, and here, and here and here!” pointing to places all over her body. As Amy and I recover in the hospital, Holly will stay with my parents – her grandma and grandpa. These will be her first overnight stays apart from either of us since she came into our world. Of course, my folks plan on keeping her wildly entertained and at least a little spoiled. We’ll have plenty of contact each day including visits both while we’re in the hospital and once we come home. Holly’s school schedule will be kept up through the rest of the school year. Then she’ll go to day camp with her friends. There will be play dates and visits with her cousins. I expect that Holly will have occasions to show us lots of love and affection. There will also doubtless be frustrating times for her during the recovery when she’ll want me to lift her high in the air and swing her around as I normally could before the operation. We’ll get through it because we’re in this together. The timing of the operation, in many ways, helps Holly to understand and mentally prepare for what is about to happen, given that she’s four years old now and can remember facts and apply them in creative ways. Her empathy is growing and she wants to be on the side of helping (her way, of course!) 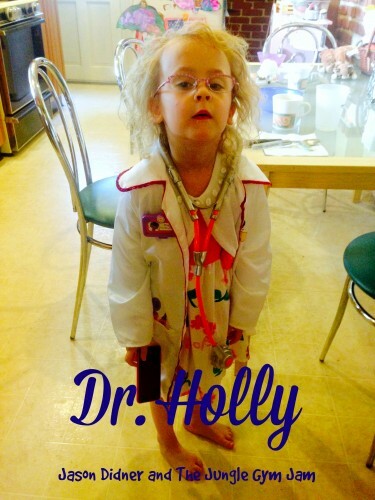 When Amy and I first started going to the transplant center to get on the waiting list for a kidney-pancreas pair from a deceased donor, Holly was just turning three. Had the transplant happened then, managing Holly’s reactions would have certainly been tougher, although still possible. I hope this surgery and recovery process will help our family bond in new ways; that the experience will set us up for a strong relationship and a happy childhood for our daughter that she’ll cherish remembering in her adult years. What sort of difficult changes in the family have your children needed to understand? In what ways have you seen their resilience in action? Please discuss in the comments below. I love hearing what you have to say. NOTE: Helicopter Mom and Just Plane Dad are praying for Jason, Amy and Holly throughout this difficult process. Please join us in wishing them well on Facebook and Twitter.